Duluth’s Chester Congdon is best known as the man who built Glensheen, the elegant Jacobean manor house and estate perched along the shore of Lake Superior at 3300 London Road. Congdon, an attorney by trade, made his fortune after becoming chief counsel for the Oliver Mining Company in 1892. When the company was bought out by J. P. Morgan in his effort to create U. S. Steel, Congdon became one of the wealthiest men in Minnesota. The lifelong Republican was an admirer of Teddy Roosevelt—particularly Roosevelt’s efforts to expand the national park system. Using his newfound wealth, Congdon laid the groundwork for an international highway along Lake Superior’s North Shore. Chester and Clara Congdon were living in St. Paul, Minnesota, in the 1880s—the time when neighboring Minneapolis was developing its extensive parkway system that linked together parks, lakes, residential neighborhoods, and the river. the expense of building the road between the city and London has thus far been borne by the city, the town of Duluth, Mr. Tischer, and Messrs. Norton & Wisdom—only one property owner, Mr. Mitchell, of Lexington, Ky., having refused to contribute to that object… As the town of Duluth and the county have each been taxed to the utmost limit for road purposes, the property owners along the road, except Mr. Mitchell, have determined to complete the road in front of their premises in the same manner as that portion in the city limits. The newspaper also reported that the road had already become “quite a fashionable drive-way.” By the 1890s, London Road was paved with macadam, a type of road surface made up of even-sized broken rock that was compacted and held together with tar. Bicycles were all the rage, as they had become available and affordable for middle-class families, and London Road was a popular place for “wheeling,” the term used for the new sport of bicycle racing. 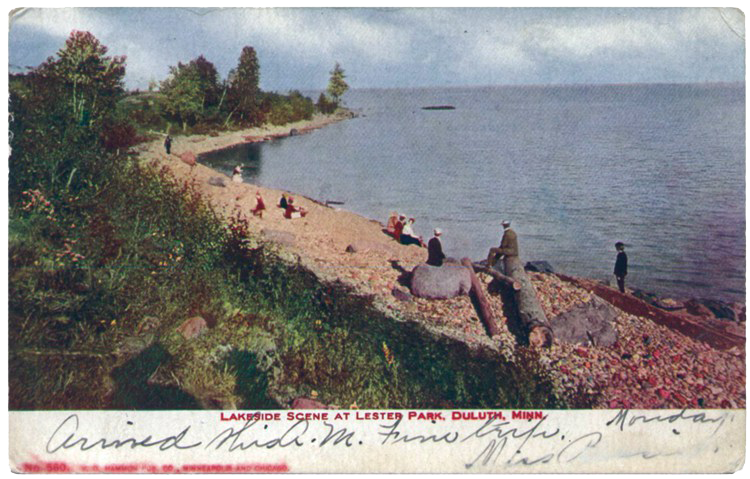 In 1892, the same year Chester Congdon moved his family to Duluth, the local cycle club held its first annual Duluth-to-Lester Park race on London Road.When Chester and his wife, Clara, chose the site for their home, London Road was still mostly forested between Twenty-first and Fortieth Avenues East. He was likely already forming plans to extend this scenic road north to Canada, but he did not share his vision publicly. According to Glensheen Director Daniel Hartman, around the time he began construction of the estate, Congdon also started purchasing land along Lake Superior’s North Shore, from Duluth’s Tenth Avenue East to the county line just outside of Two Harbors. Congdon knew he would not be able to purchase all the land needed for the road on his own, and he recognized that the City of Duluth did not have the power to condemn land outside the city limits. While serving as a state legislator between 1909 and 1913, he introduced a bill allowing “cities of the first class” (Minneapolis, St. Paul, and Duluth) to annex land outside of city limits for transportation reasons. Passage of this bill was an important step in making it possible for Congdon to realize his vision for a scenic North Shore road. By 1913 he had succeeded in purchasing about one-third of the land he needed to build the road from Duluth to Two Harbors. He went public with his plan when he asked the city to condemn the parcels he had been unable to buy outright. He offered to cover the cost of acquiring the land and constructing the road, which he called the Lake Superior International Highway. Mr. Congdon has paid all engineering expenses in connection with the boulevard sight [sic], and has borne the cost of award through condemnation by the city. Mayor Prince announced that this amounted in round numbers to $40,000. The right-of-way includes rights in the lake along the scenic stretch.